Nike‘s Air Max 97 continues to steal the spotlight. Following up on a tonal “Mustard” look, the retro silhouette now puts on a classic “Midnight Navy/Habanero Red” outfit. This colorway features a leather and mesh upper in “Midnight Navy” with light blue stripes and a reflective 3M band. “Habanero Red” accents come by way of the embroidered mini Swooshes, inner lining and branded heel pull tab, while another touch visits the black outsole. A signature white Air Max sole unit lets in a visible Max Air unit in yellow for a final dose of vibrancy. 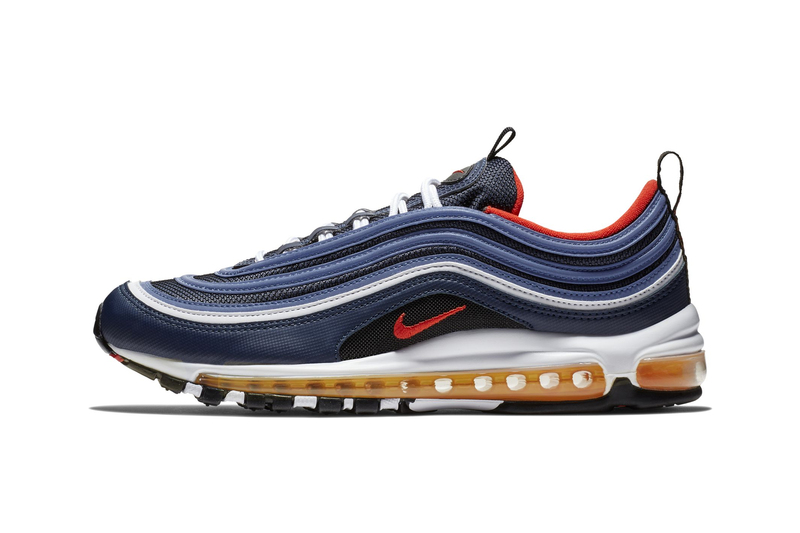 The Air Max 97 “Midnight Navy/Habanero Red” will release sometime in September for a retail price of $160 USD at Nike’s web store. Share your thoughts in the comments below and for more navy and red sneakers, check out the Nike Air Max 1’s premium leather colorway. Nike Air Force 270 Utility Straps Up in "Sequoia/Habanero Red"